Marie-Danielle Samuel for reviewing prior to publication. The citadel of Machu Picchu, meaning “old peak” in the native Quechua language, is named for the mountain on which it sits. It looms 2,000 feet above the serpentine Urubamba River in the tropical mountain forest of the upper Amazon basin. The city’s finely hewn granite blocks comprise dwellings, agricultural terraces and storehouses, plazas and temples. It is recognized as a feat of architectural planning, engineering and stonemasonry and was built without the use of iron tools or draught animals. Machu Picchu was constructed around 1450, at the height of the Inca empire, and was abandoned less than 100 years later, as the empire collapsed under Spanish conquest. Although the citadel is located only about 50 miles from Cusco, the Inca capital, it was never found and destroyed by the Spanish, as were many other Inca sites. Over the centuries, the surrounding jungle grew to enshroud the site, and few knew of its existence. It wasn’t until 1911 that Yale historian and explorer Hiram Bingham brought the “lost” city to the world’s attention. Bingham and others hypothesized that the citadel was the traditional birthplace of the Inca people or the spiritual center of the “virgins of the sun,” while curators of a recent exhibit have speculated that Machu Picchu was a royal retreat. Regardless, the presence of numerous temples and ritual structures proves that Machu Picchu held spiritual significance for the Inca. To the Inca, the world and its environment were sacred. “Pachamama,” mother earth, cared for them, and they in turn were responsible for her care. The Inca believed the spirits of their creator resided in the natural elements—the sun, the moon, the earth, mountains, rivers, rocks, trees, wind—and they erected temples and other ritual spaces to honor these spirits, including many at Machu Picchu. The Incas’ harmonious relationship with nature is evident in the way the structures of Machu Picchu blend rather than compete with the extraordinary natural beauty of the setting. Although the region’s indigenous people were forced to convert to Catholicism after the Spanish conquest, they have maintained their traditional beliefs as well. However, because many ancestral sacred places are archeological sites and tourist attractions, the indigenous people have little access or control over them today. This is certainly the case at Machu Picchu. Machu Picchu is a UNESCO World Heritage site. As Peru’s most visited tourist attraction and major revenue generator, it is continually threatened by economic and commercial forces. In the late 1990s, the Peruvian government granted concessions to allow the construction of a cable car to the ruins and development of a luxury hotel, including a tourist complex with boutiques and restaurants. These plans were met with protests from scientists, academics and the Peruvian public, nearly half of which is indigenous. Critics worried that the proposed facilities would not only destroy the beauty of the site but would enable far greater numbers of visitors, which would pose tremendous physical burdens on the ruins. A major concern is the site’s increasing number of tourists, which has grown from 200,000 to more than 500,000 annually over the past decade. Tourists reach Machu Picchu via railway to the town of Aguas Calientes, at the base of the mountain, or by hiking the 20-mile Inca Trail, which winds through protected land. Currently, a local mayor is planning to build a bridge spanning the Vilcanota River, 12 miles northwest of Machu Picchu, that would create an alternate route to the ruins and an increased flow of tourists; the central government fears this might land Machu Picchu on UNESCO’s list of endangered World Heritage sites. The population of Aguas Calientes has mushroomed in size—from 500 to more than 4,000 in the last 10 years—as more hotels and restaurants are built to accommodate the needs of tourists, and the burden is evident in the heaps of garbage piled along the banks of the Urubamba River. The Inca Trail, which is dotted with other small Inca sites, has also suffered the impact of years of unrestricted use. Furthermore, the carrying capacity of the sanctuary has never been determined through a technical approach. In addition to threatening the preservation of Machu Picchu, tourism has also served to disconnect the region’s indigenous people from their spiritual and cultural heritage. The costs associated with visiting the site, which are geared toward foreign tourists’ income levels, make it practically inaccessible to the Inca’s descendants. Furthermore, indigenous groups play no role in determining management policies. Also of concern to indigenous groups is the desecration of burial sites and the removal and display of human remains from Machu Picchu and other Andean locations. In October 2002, archaeologists discovered the first full burial site at Machu Picchu, and administrators say the remains will be put on display to further stimulate tourism. Natural threats also exist, most significantly fires. According to the UNESCO report, one-third of the forests in the protected area surrounding Machu Picchu have been affected by fire, often set by small-scale farmers attempting to clear land. In 1997, a fire destroyed vegetation immediately surrounding the ruins and reached the lowest terraces of the site. Landslides are another serious natural hazard. At times they have covered different sections of the railroad line, and the potential danger to Aguas Calientes is high. In 2004 several deaths occurred as a result of mudslides in the sanctuary. In addition, the ground on which the ruins stand is subsiding, causing the destruction of several buildings. 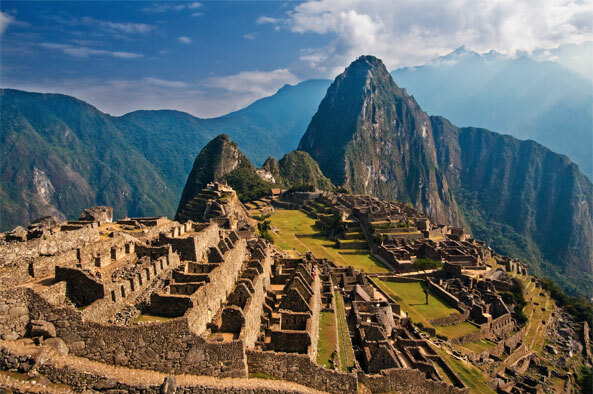 After repeated recommendations from the World Heritage Committee, Peru established a master management plan and managing body for the Machu Picchu Historical Sanctuary in 1998. However, the plan only presented general policies and guidelines, and in practice was often ignored. In 2002 UNESCO sponsored another fact-finding mission, partly in response to the damage caused to the Intihuatana, and found the level of management and site conservation to have improved only marginally. The mission urged the development of a revised master plan, to be completed by 2003, to better address and respond to concerns such as visitor management, transportation issues, overdevelopment at Aguas Calientes, natural-disaster threats, and the site’s sacred values and their relevance to traditional communities. In 2002 and 2003 the World Heritage Committee threatened to place Machu Picchu on its List of World Heritage in Danger if Peru failed to address the various conservation and management concerns. The Historic Sanctuary of Machu Picchu was inscribed as a UNESCO World Heritage cultural and natural site in 1983 and comprises about 80,000 acres. Its protection is mandated under the U.N. convention as well as Peruvian law. In 2005 the Peruvian government finalized and adopted its revised master plan for the conservation and management of the sanctuary, and it appears to better address the major conservation and management concerns. The World Heritage Committee is now urging the Peruvian government to develop a sustainable financing strategy to ensure the ongoing implementation of the master plan, a risk-preparedness plan to mitigate the damage caused by annual fires and landslides, and plans for restoring major archeological sites, among other things. Programa Machu Picchu, a conservation program funded through a debt-swap arrangement with the Finnish government that operated from 1997 to 2002, helped to strengthen the administration of the sanctuary and to establish strategies for protecting the environment and for the development of Aguas Calientes. Its accomplishments include the implementation of fire-prevention and waste-management plans and publications documenting biodiversity. In 2001 the Peruvian government implemented regulations to reduce the impact of tourism on the Inca Trail and at Machu Picchu. Current law limits the number of people on the trail each day to 500; previously during the high season, as many as 1,000 hiked the trail daily. The law also stipulates that all tourists trek with registered companies, which helps ensure that hikers adhere to trail conservation rules. More recently, in order to enforce the 500-trekker limit, the government began requiring tour operators to submit the names and passport numbers of its clients in order to purchase the necessary permits. Cumes, Carol. “Machu Picchu: Consecration or Desecration?” Planeta, April 2009. Emmott, Robyn. “Tourist boom threatens Peru’s Machu Picchu” Reuters Alert Net, November 26, 2003. Hurtado, Luis Delgado. “Lo Sagrado de Nuestro Cultura, Para el Mundo Andino del Peru.” Presented at Cultural Heritage and Sacred Sites: World Heritage from an Indigenous Perspective, New York University, May 15, 2002. Instituto Machu Picchu. Instituto Machu Picchu. United Nations Educational, Scientific and Cultural Organization. “Historic Sanctuary of Machu Picchu.” UNESCO World Heritage Center. Yachay Wasi. “Report of Sacred Sites and the Environment from an Indigenous Perspective.” Yachay Wasi.